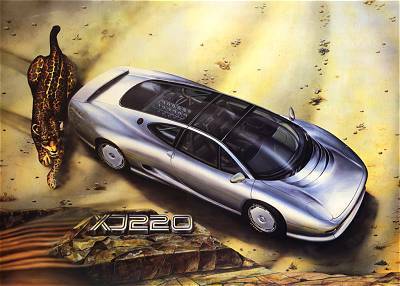 A large wall poster depicting the original XJ220 V12 prototype in a surrealistic setting. This is one of a limited edition of 500 prints commissioned by Sir John Egan in 1988. Each print is individually signed by the man behind the XJ220, Jim Randle, Sir John Egan and the artist Spencer Traut (actually Michael Spencer).